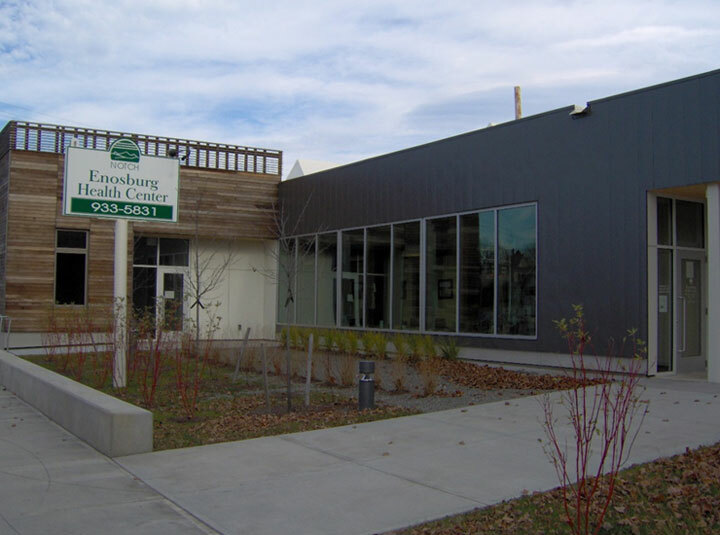 WHEM has worked for Richford Health Center, Inc. to assist in the redevelopment of a 0.62-acre brownfield property on Main Street in Enosburg. The Phase I ESA revealed several issues stemming from the spills on the property that occurred while occupied as a gas station (1920s-1950s) and then bulk petroleum facility (1950s-1990s). After performing a Phase II ESA and then a Corrective Action Plan, cleanup culminated with the excavation of 130 tons of petroleum- contaminated soil from the rear portion of the property in October 2011. Additional work completed for RHC included coordinating and overseeing the abatement of 2,500 square feet (sf) vinyl asbestos tile from one of the buildings, the completion of a National Environmental Policy Act (NEPA) environmental assessment required for federal funding, and coordination and oversight of the removal of two abandoned hydraulic lifts from the property. Redevelopment of the property into a 5,500 sf community Health Center building with a new 10,500 sf parking lot and 2,500 sf patient drop-off area was recently completed.